PopCap Game’s Plants vs. Zombies (link will open iTunes) was unleashed upon the iPhone/ iPod touch today. Priced at $2.99, this app is sure to change your outlook on the power of sunflowers. The 2009 game of the year is now on iPhone and iPod touch! 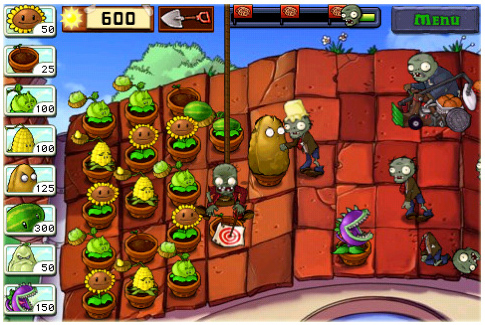 Get ready to soil your plants in this Adventure mode version of the hit PopCap game! A mob of fun-loving zombies is about to invade your home, and your only defense is an arsenal of 49 zombie-zapping plants. Use peashooters, wall-nuts, cherry bombs and more to slow down, confuse, weaken and mulchify 26 types of zombies before they can reach your front door. Each zombie has its own special skills, so you’ll need to think fast and plant faster to combat them all. But be careful how you use your limited supply of greens and seeds… as you battle the fun-dead, obstacles like a setting sun, creeping fog and a swimming pool add to the challenge. And no matter where you take this iPhone version of the hit game, the fun never dies!